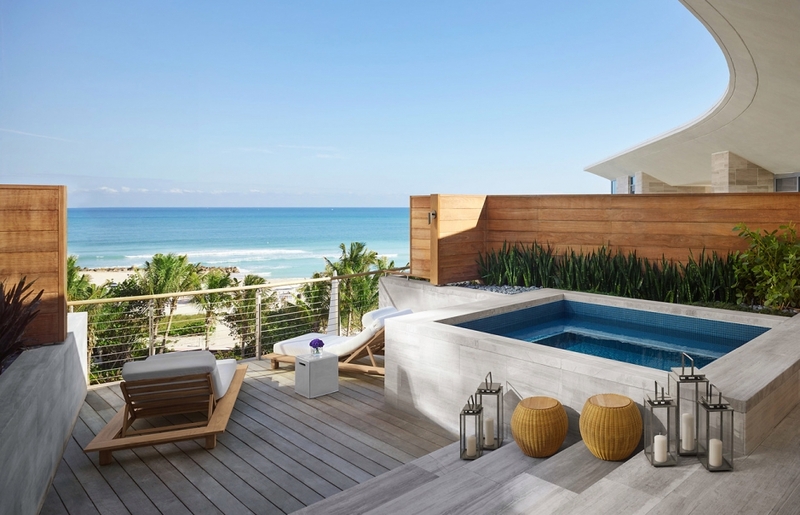 Hotelier and entrepreneur extraordinaire Ian Schrager is back at the top of South Beach with the December 2014 debut of the new Edition Miami Beach, a sceney sleep with two pools, a nightclub, a bowling alley, a skating rink and a celeb chef–helmed restaurant—set on three and a half beachfront acres. 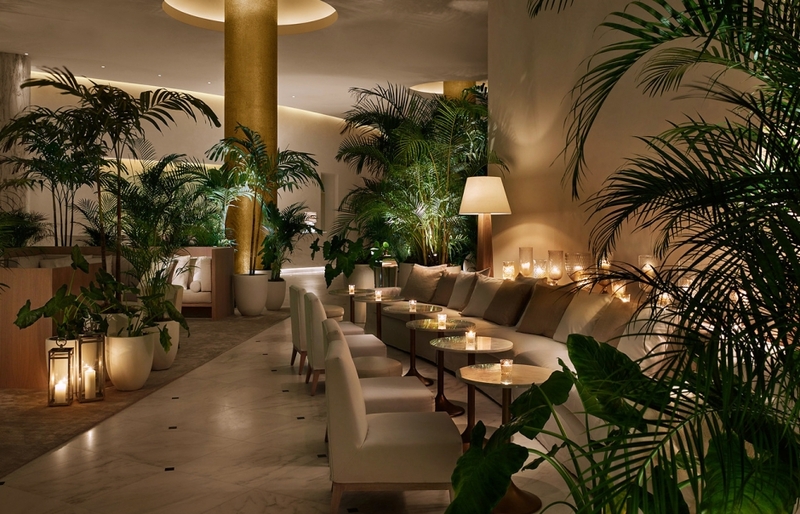 Ian Schrager and the Edition team took pains to preserve the 1955 Seville Hotel, proof that Art Deco style is king here. Miami’s strict architecture code forced them to preserve many of the in building’s original 1955 Art Deco details, including the lobby’s brilliant white marble floors and gold mosaic tile columns. 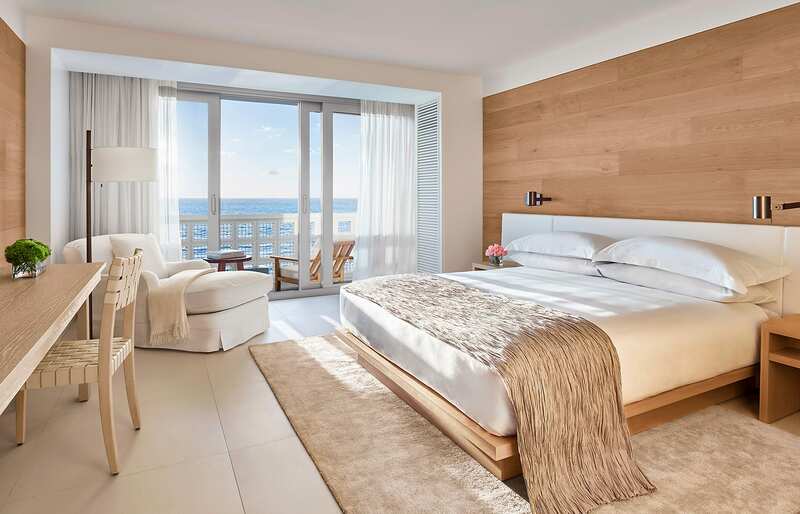 All 294 guestrooms and 23 bungalows are understated, by Schrager’s standards, and appropriately beach-chic: light oak-paneled walls, white furnishings, sand-hued accents and ivory porcelain slab bathrooms. 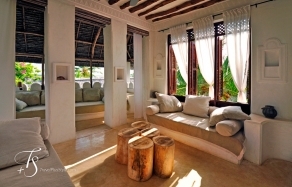 Many of the 294 guestrooms offer private terraces with direct beachfront views, finished with custom upholstered teak lounge chairs and glazed ceramic side tables. 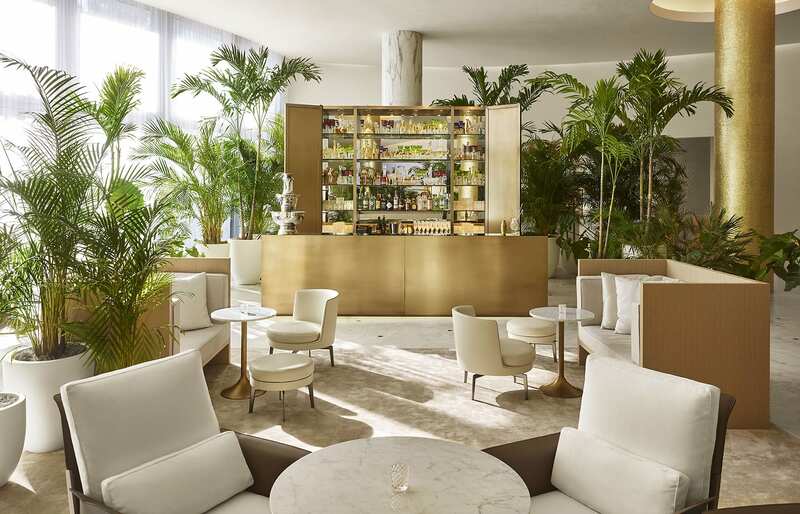 The vaunted Jean-Georges Vongerichten makes his Miami Beach debut in the sophisticated Matador Room, serving a modern interpretation of Latin cuisine influenced by Spanish, Caribbean and South American flavors. Throw caloric caution to the wind with the fried chicken, biscuits and other haute downhome fare at Yardbird Southern Table & Bar, a local favorite filled with pretty people getting down and dirty with bourbon and barbecue. Ocean Drive offers some wicked fun, especially at the neighboring Palace South Beach, renowned for its colorful drag shows. 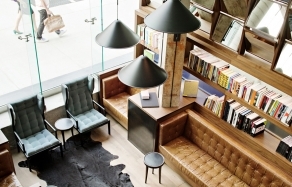 Parallel streets Collins and Washington avenues feature world class dining and nightclub options, ranging from the Bazaar by José Andrés in the SLS Hotel to Mansion nightclub. Perpendicular to the beach, walking mall Lincoln Road is great for people-watching and café-hopping. Text courtesy of Jetsetter.com, modified to fit the format. Enjoy movie nights under the stars in a hammock while sipping on a cocktail. Ocean Drive itself can be touristy and mediocre foodwise—with the exception of Prime 112, De Rodriguez Cuba and BLT Steak.